OrientDB is a distributed graph database. It is incredibly fast, and can process/store records up to 220,000 per seconds. It has ability to store data in the Documents format as well. It is second generation database system and comes with lot of features and meets the current computing needs. You don’t need any special hardware to run OrientDB, it runs flawlessly on normal hardware. It gives you complete control over your databases, you can traverse, update, delete or perform any common database operations easily. Let’s see how we can install this database system on Ubuntu 15.04 and its derivate Linux Mint. The following installation process has been tested on Linux Mint and Ubuntu 15.04. It should work fine for all other Ubuntu derivatives too. First of all, let’s install dependencies for OrientDB. We have listed them below, following mentioned packages should already be installed on your system before you go ahead with OrientDB installation. Launch your system terminal and run following command to install them. Our Linux system is all set to install OrinetDB, launch your system terminal and run following command to clone the online OrientDB repository to your local system. Here is how the successful clone process should look like. Here run following command to install OrientDB. It will hardly take few seconds to complete the installation process. Here is how the successful installation process should look alike. Start the OrientDB server by running the following command. Please note that “&” sign at the end of command, it will keep the server running in the background even if you close your terminal window. During the very first time launch, it will let you set root password for your OrientDB installation. 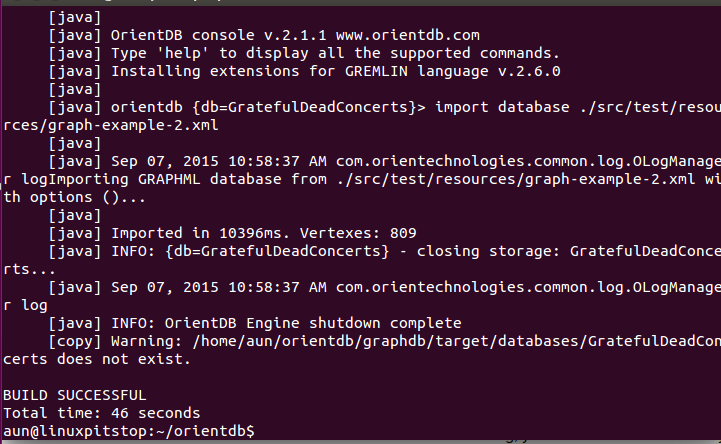 Just like MySQL, OrientDB is completely manageable via console interface too. You can create databases, list them, perform common database operations via command line. 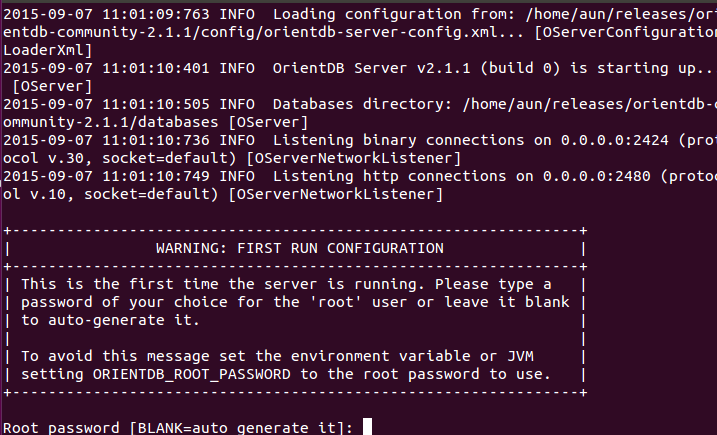 Run following command to access OrientDB console. Make sure you are in the correct directory when you run this above mentioned command i.e. “/home/USERNAME/releases/orientdb-community-2.1.1/bin”. This is how its console looks like. It is a NO-SQL, multi model database management system. Being an open source project, it provides lot of room for improvements and customization. It has capability to handle complex database transactions and is usually considered a secure DBMS. It supports ACID transactions model and is considered a suitable choice for distributed databases.